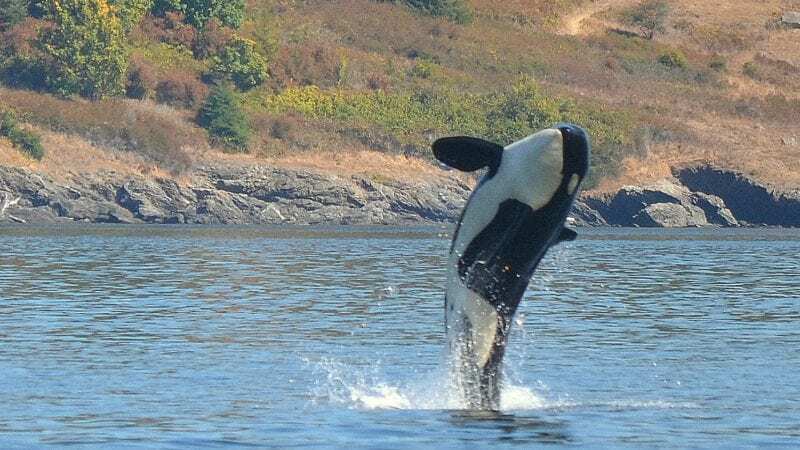 An orca breach around San Juan Islands. Photo credit Sarah McCullagh, San Juan Outfitters. There are whale watching boats and then there are whale watching boats. It is much like being a tourist versus being a traveler. 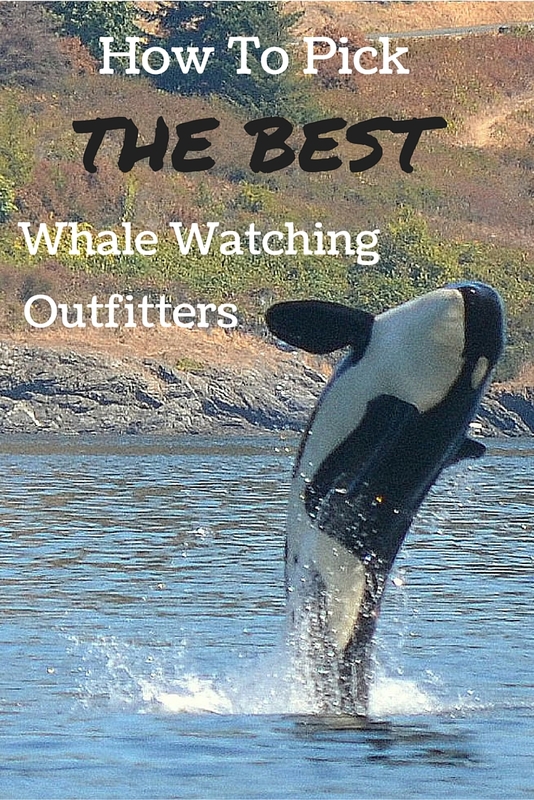 You can get on any boat and head out and hope to see a few whales and that is pretty cool, but if you have traveled all this way, why not go with the best? By the best, I mean experts: trained naturalists and marine biologists who are not just full of excitement about the area and the marine life, but who have passion, true passion for this amazing area. 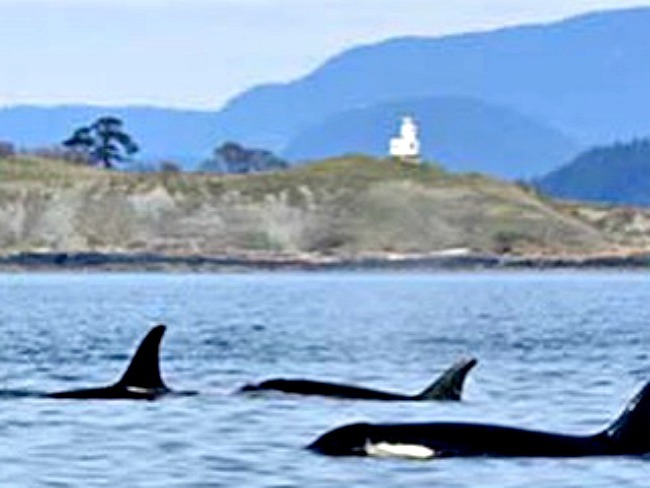 A good day whale watching around the San Juan Islands. Photo credit Dana Zucker, Triathlon Traveling Mom. My husband and I first decided to head up to the San Juan Islands when we were planning a trip to Seattle. We began our search on line, visiting the local visitor’s sites, TripAdvisor, and Yelp. Once we found what people considered some of the “best”, we narrowed our trip to a few days stay on San Juan Island. Whale watching was a must, but I was very nervous about the type of boat we would be on. I had both preconceived notions that had to be overcome and requirements for the type of trip I wanted. All of the boats would be packed full of tourists. The boats worked together to find whales and then herded them much like the shady dolphin watch boats. The boats were not safe. So, my search began. I narrowed the outfitters down and called the San Juan Visitor’s Bureau. 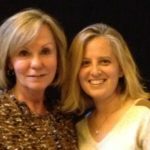 I had the pleasure of speaking with a fabulous member of their team who gave me so much information that we decided to extend our stay two nights. After about 30 minutes on the phone and listening to the type of experience that we were looking for, she recommended that I reach out to San Juan Outfitters. I happened to call and got Brian, the owner, on the phone. Well, after about 15 minutes of getting answers to questions about what type of trip I was looking for, we decided to stay three nights on San Juan Island and spend two days on the water with San Juan Outfitters. 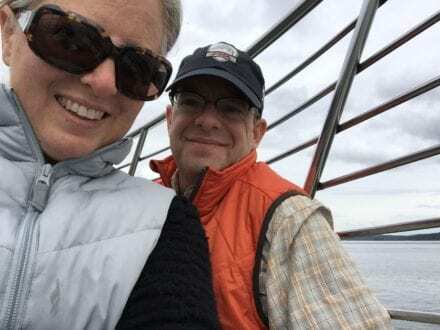 Brian suggested we spend our first day with them whale watching and booked us on their afternoon trip one day and then the next day, he recommended a five hour kayak trip. WOW- all I can say is WOW. We met our crew and 22 other boat mates at the docks and boarded a 42’ MV Sea Hawk. The type of boat meant little to me as I know nothing about boats, but it was a very clean US Coast Guard inspected boat and THAT was very important to me. The crew met us and escorted us to the boat. Our whale watching boat. Photo credit Dana Zucker, Triathlon Traveling Mom. The crew included the captain and two naturalists/biologists. 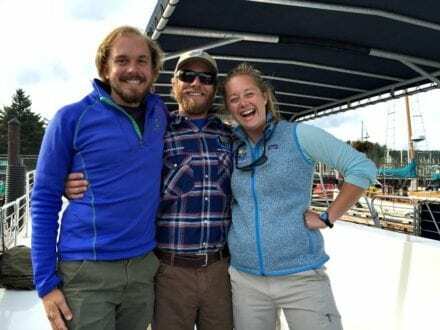 We learned all about working on a whale watching boat from a team very educated in their field – a team who, in the off season, travels the world working and learning or working locally with the community and/or children in this field. The crew of San Juan Outfitters. Photo credit Dana Zucker, Triathlon Traveling Mom. One of our naturalists had degrees from UNC Chapel Hill and New Hampshire University. After the captain gave us our safety briefing, our naturalists, Sarah and Eric, took over. They gathered us all together for a bit and described what we might be seeing. They explained the behaviors of the sea life and also the whale pods that were in the area. Before we even got out of the dock, I felt I was well-prepared and ready to start “watching”. Sarah and Eric welcomed us aboard the boat to start our adventure. We and a few other people moved to the front of the boat while others moved into the inside area to stay out of the cold. Sarah brought us blankets and stayed with us, showing us where to look for certain birds and explaining the animals and behaviors of the sea life we were seeing. Truthfully, her genuine excitement over what we were seeing brought a tear to my eye. I was both so happy to be witnessing this and honored to know through her how special it was. On board and ready for our whale watching adventure. Photo credit Dana Zucker, Triathlon Traveling Mom. Once we got out to sea, the “whale watching area”, Sarah and Eric got into position and pulled out identification sheets. This is another aspect that sold me on San Juan Outfitters. They were part of the Pacific Whale Watch Association professional spotting network. Well, spotting we did! Our team pointed out and identified all the whales we were seeing. It was an amazing day. We saw whales from all three of the resident pods, as well as the transit whales. The whales were so active that the captain put the microphone into the water for us to listen to the whales communicating. The team really explained so much to us about the families we had the opportunity to observe. 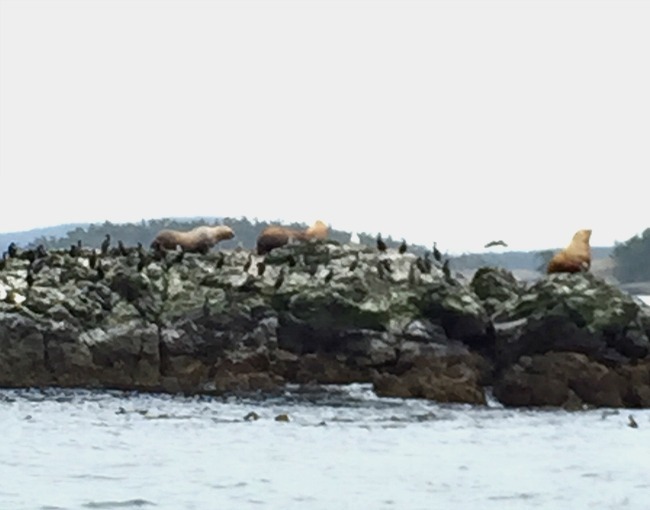 We saw not just whales, but some seals, sea lions, porpoises, and other amazing sea life. Some of the sea life around San Juan Island. Photo credit Dana Zucker, Triathlon Traveling Mom. While we saw and heard other boats, I really appreciated that I was with this crew. It felt authentic and respectful. We were all alone and the Captain said he was going to have to bring the boat down a bit as the area was very active and he did not want to get in the way of the whales. A few minutes later I was surprised to hear a loud tourist boat come into the area and then another with the Captain’s voice blasting over the loud speaker telling people where to look. The entire boat sat there almost in silence, just watching the magic around us. 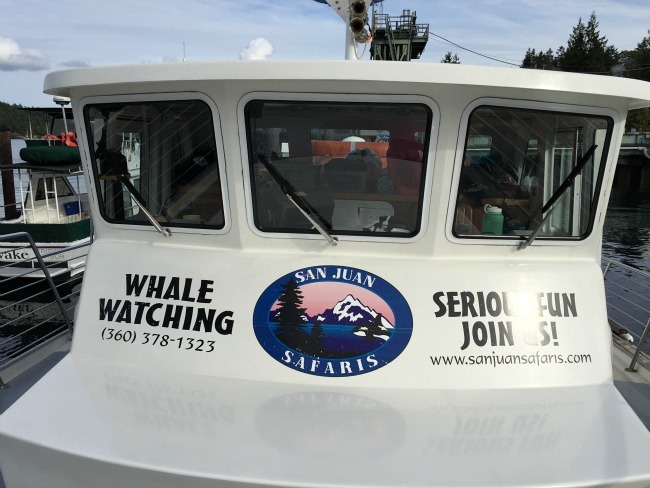 I am sure there are other wonderful whale watching companies out there, but I need to tell you, I was so happy to be with San Juan Outfitters. Not just happy, but honored to be with stewards of the waters and all the sea life that calls the San Juan Islands home for all or part of the year.